Now that the days are beginning to grow shorter, we know that fall is just around the corner, and that means we truly are in “back-to-school” mode! We have much to look forward to during the 2018—2019 academic year and already are off to a great start! We now all have special memories of Convocation where 188 new undergraduate Nightingales embarked on their journey to becoming professional nurses, the Welcome Back Breakfast for faculty and staff, and our New Student Welcome – all held in August. Our Journey to Transformation is well underway, as evidenced by construction workers having made “joyful noises” all summer. Your patience and flexibility is critical and appreciated with these needed changes. I’ll be providing you with timely updates, so you’ll know what’s next during this exciting time. We are continuing to move ahead with our Comprehensive Strategic Plan, organizing the workgroups and making sure that every step of the process is not only moving in the right direction, but at the right time so that we’re ready to welcome future students to an enhanced campus with innovative programs and services. Already your faculty and staff are working with me to prepare for the April 2019 visit from the Higher Learning Commission for reaffirmation of our accreditation. The visit validates the quality of an institution and evaluates multiple aspects including academic offerings, governance and administration, mission, finances, and resources. The next group planning session for faculty and staff is October 9, from 8 am to noon in the Lounge. We will be ready! I know you will join me in extending sincere congratulations to faculty and staff who will be recognized on September 26 at the annual Excellence in Nursing Awards Celebration: Members of our Graduate Program faculty – Noah Grose, MSN, BSN, ACNP-BC, adjunct faculty, Adult Gerontology Acute Care Nurse Practitioner program; and Susan Schultz, MSN, BSN, special instructor II. Members of our Undergraduate program faculty – Mary Gregg, MS, RN, CNM, assistant professor; Jami Nininger, MSN, RN, assistant dean of Distance Education; Miriam Abbott, MA, assistant professor, Academic Department Leader, Humanities; Dale Hilty, PhD, MA, MEd, BA, associate professor; Meghan Hixenbaugh, MS, RN, CPN, CPNP, instructor; and Cora Arledge, MS BSEd, RN, instructor and program coordinator, MCCN—Lancaster. 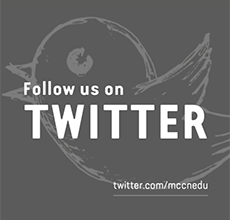 Members of our staff – Karen Greene, MSN, RN, FNP, assistant professor; and Gale Kolarik, administrative secretary, Admissions. 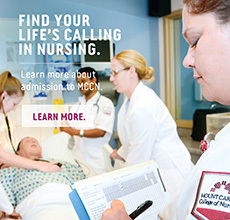 Finally, I want you to know that I am honored and humbled to be named President, Mount Carmel College of Nursing. In the time I’ve spent with you – just over a year now – I’ve come to appreciate the rich heritage of the College, the dedication of the excellent faculty and staff, the loyalty of the alumni, and most of all the diligence and eagerness of our students – who truly are the future of nursing. I thank the Board of Trustees and the leadership of Mount Carmel Health System for putting their trust in me. And, what an honor it is to be named President this year of all years, as we celebrate our 115th Anniversary since our founding by the Sisters of the Holy Cross. I know that – together with you – we will carry forward the stellar reputation of the College into its bright future.